Discipline is a constant question on parent’s minds and usually starts with the phrase – “What do I do when my child hits their sibling? What do I do when they won’t listen? What do I do when they won’t go to bed? !” There is no shortage of advice given to parents on how to deal with children’s behaviour, but the amount of information is staggering and often contradictory. What parents don’t often hear in relation to discipline are the reasons why different strategies work when they do. There is a belief that because a child’s behaviour changes or is subdued that the disciplinary strategy is good. What isn’t taken into consideration is the impact of discipline on human development, relationships, and a child’s emotional system. The one theme that pervades disciplinary approaches used in homes and schools today is that they are separation based by design. Separation-based discipline refers to the removal of something a child cares about for the purpose of getting compliance and to reduce certain types of behaviour. Separation based discipline comes in many forms but is commonly referred to as time-outs, 123 magic, pretending to leave a child when they don’t follow, taking away things they care about until they comply, ignoring and giving them the ‘cold shoulder’, punishing them with spanking, or shaming them in front of others. They are other forms of separation-based discipline, but the underlying theme is the same – if you misbehave you will face separation from the things you care about. The hope in using this approach is that the pain inflicted will teach a child a lesson they will remember the next time they act. The assumptions are that we have to hurt a child in order for them to learn, that lessons are needed in order to make a child civilized and humane, and that a child is always capable of controlling themselves. All of these ideas are false when you consider developmental science and what really grows a child up. In other words, if pain was such a great teacher along with lessons, we shouldn’t have so many adults who act immature and inhumane. The problem with immature behaviour is that the solution to it does not lie in lessons but in understanding human development and relationships. Children will try to behave for the adults they are attached to, and in turn, it is this attachment that grows them towards responsible, caring, and civilized ways of relating to others. Lessons never made anyone grow up, but a caring heart and a mature, integrated brain capable of tempering impulses and emotions surely will. What should we consider when thinking about discipline? The questions we need to consider with discipline is the ultimate impact of an approach on a child’s attachment to their adults and on their development? We should be concerned with whether discipline provides a way for an adult to hang onto a relationship with a child while dealing with the chaos that comes with their immaturity. We should consider whether the disciplinary approach takes a developmental perspective and considers whether self-control is possible, and/or whether emotional stress or immaturity has hijacked the ability to regulate strong feelings? Many approaches to discipline suffer from the same problem – they are reactionary in nature and are meant to solve problems quickly. Quicker doesn’t mean better for a child and is often at the expense of their relationship with an adult. At the same time, children can be chaotic, unpredictable, aggressive, and immature, so adults do have a responsibility to intervene to restore order when necessary. But there is a difference between restoring order and making headway on helping a child act more civilized. Discipline approaches that understand this and use relationship to make headway with behaviour are better for a child developmentally. Not everything we do with kids has to happen in the heat of the moment when emotional defenses can be high, patience is short, and frustration is boiling. The belief that we have to instill lessons immediately is the leftover remnants of a behavioural management approach that fails to take into account human emotion and development. The challenge for parents is that separation-based discipline has become popular because they seem effective in quelling behaviour but what is equally clear is that the potential long term detrimental effects are not well understood. What is the problem with separation-based discipline if it stops behaviour? Responsible parents agree on the need to raise mature, caring, and socially responsible kids. The problem is not with the goal, but with how we get there. The problem with separation-based discipline is not that it tries to deal with uncivilized behaviour but how it hyjacks attachment needs to get there. The most important need a child has is for an attachment with a warm caring adult who takes the lead in providing for them. Children are not meant to go it alone and be independent from their adults. They are meant to seek out adults who are in the best position to lead and provide for them. It is through relationship that a child is informed, oriented, guided, directed, looked out for, and learns values, thus creating the best chance of compliance. Kids follow the people they are attached to and as a result, want to be good for them. The problem with separation-based discipline is that it uses attachment against a child. A child is removed from contact and closeness with the people or things they are attached to as a means of making them feel distressed, in the hopes that it will teach them to do better. Separation-based discipline can activate the emotion of alarm and it is this emotion that makes a child scramble to get back into good graces with a parent but at the cost of greater insecurity. Some might ask what is the problem with alarming a child to make them behave? The parent is made an adversary instead of a caring and firm adult to lean on. Alarming experiences can lead to insecurity in the relationship where the child is more concerned with acting right rather than resting in the care of their adult. In other words, if a child needs to be good enough in order to stay close to the people and things they are attached to, then they can’t hold onto them for safety. When the invitation for relationship is made conditional, temporary, and unpredictable, with a child’s immaturity threatening to overturn it, children cannot rest, play, and grow. Separation-based discipline is a problem because you cannot lean against someone who pulls the rug of relationship out from underneath you when your immaturity reveals itself. Separation-based discipline is a problem because it can prevent a child from forming deep relationships with adults because they are worried about being hurt or sent away. 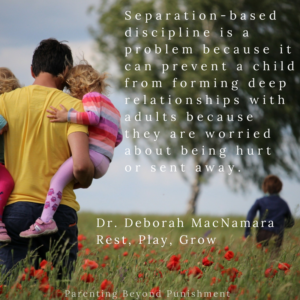 Separation-based discipline is a problem because it can harm the relationship that is needed to guide a child to acting better, doing better, and in setting expectations for behaviour. Separation-based discipline erodes a child’s desire to be good for us and backfires developmentally in the long term. The bottom line is separation-based discipline should come with a warning label but it doesn’t. There are more effective approaches that can help a child grow towards increasing self-control and mature forms of relating. Positive, gentle, and attachment-based forms of parenting have long advocated for more attachment safe and developmentally friendly discipline. The following strategies are from Gordon Neufeld’s relational and developmental approach and seek to preserve attachment while steering a child towards mature relating towards others. Collect before you direct – Collecting a child means harnessing the power of attachment to bring a child onside and point them in the right direction. It means getting to the child’s side and engaging with them in a way that increases their desire to follow you – like taking note of what they are doing, helping them, or starting a conversation. The goal is to work inside the relationship when trying to get a child to transition, to obey rules, and treat others appropriately. When adults take the time to collect the attachment instincts before working with kids, the chance of agreement is higher along with their influence. The secret to collecting a child is to convey a genuine invitation to be close to them with the expression of warmth, delight, and enjoyment. Lead through incidents with a caring and firm manner –If we can lead through stormy situations with our relationship with a child in tow, we are in a better position to address problems once emotions have calmed. We can take the lead in controlling circumstances around a child, like moving other kids out of harm’s way, in taking objects that be used to hurt others, and creating a safer space for all. If we convey to a child what they cannot do, we need to follow-up in some way that the relationship is still okay. We need to lead through incidents by being both caring and firm in our approach knowing that kids feel safe when adults take the lead. Drop the infraction flag and revisit incidents when emotions are lower – The goal of discipline is to restore order. In situations that are emotionally heated and out of control, our first job is to lead through the disaster. Dropping the infraction flag can be used to get through the impasse and can be as simple as acknowledging what isn’t working, for example, “that is not how we talk to sisters or Mothers – we are going to talk about this later.” We could also state – “this isn’t working and will need to change – I am sure we will find a way to work on this.” When we come back around to a child to talk about events we can acknowledge their emotion and inform them how we want to handle events next time. With maturity, time, and patience, our children will eventually be able to follow and get there. Solicit good intentions and get kid’s in the driving seat with their behaviour – Instead of giving consequences (which are often separation based in nature) to a child, it is better to try and work ahead of problems. You can collect a child’s attention and orient them to what is coming and how you would like them to act. You can ask a child, “can I count on you to hold hands on the outing” or “to use your words instead of hits when frustrated,” – and many more actions that are more civilized. It is easier to change a child’s mind about how to act than their actions in the heat of the moment. Help a child face futility and adapt to the things they cannot change – Children will face situations where people don’t want to play with them, where they can’t change the outcome, where they can’t get what they want, they are not first, they have to let go of something good, and so many more futile things. The goal is to help move their mad feelings into sad ones by giving room for upset to come and by coming alongside and acknowledging what is difficult. We can invite their sadness or tears by recognizing that losing is frustrating even though it is part of life. We need to lead them to accept what they cannot change – not by talking them out of their feelings but by helping the to vulnerably feel them. When kids can let go of what doesn’t work, they learn they can survive when things don’t go their way and are less prone to react as strong the next time. Discipline doesn’t grow our kids up, it is what we do while waiting for maturity to deliver the fruit of healthy development. When we do our jobs in leading and providing for our children – even through the storms in their life – then nature will do the rest. We need to use our relationship to keep our children’s hearts soft and to ensure they follow us as we lead them to responsible, caring behaviour.